When the invitation arrived for me to join Canadian globe trotters Live.Travel.Play for a short while when on their Turkish section of their world tour, I jumped at the opportunity. Back in part 1 & 2 we experienced skies full of hot air Ballons and some amazing cave exploring in the side of mountains at The Red Valley Cappadocia. In part 2 there was still no shortage of exploring but that time for us it was all about tracking down the best food and drink as well as putting Lucky, the Vanagon through it’s paces by taking it off road once more. In part 3 we explore the biggest underground city in the area and have one last explore of an area we found by pure chance. This ended up to be the best yet.. Sit back grab a beer and enjoy this amazing part of the world with CampervanCulture.com and Live.Travel.Play. This entry was posted in campervanculture.com, Vanlife Explorers Visit Cappadocia Turkey on March 14, 2019 by jed@CampervanCulture. Back in part 1 we experienced skies full of hot air Ballons and some amazing cave exploring in the side of mountains at The Red Valley Cappadocia. In part 2 there is still no shortage of exploring but this time for us it was all about tracking down the best food and drink as well as putting Lucky, the Vanagon through it’s paces by taking it off road once more. This entry was posted in campervanculture.com, Vanlife Explorers Visit Cappadocia Turkey on March 7, 2019 by jed@CampervanCulture. The best part of working at CampervanCulture.com is the people you meet and the places you get to explore. 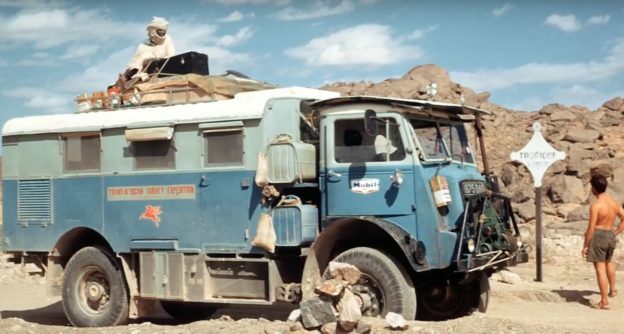 Janice, Gregor and their Vanagon named Lucky are Canadian globe trotters that have been over four years living ion the road. Their adventure started in Canada where they then headed south to the very bottom of South America. They then shipped to Europe and have ventured to far flung corners such as Iceland and Morocco. When the invatation arrived for me to joint them for a short while to experience a part of the world that has been on my own personal bucket list for a good while now, I jumped at the opportunity. This entry was posted in campervanculture.com, Vanlife Explorers Visit Cappadocia Turkey on March 1, 2019 by jed@CampervanCulture. This seasons trip is out east and the goal was to reach and travel throughout Transylvania. This is part three of a three part film series that you guys are invited to watch and be in the driving seat with us and along for the ride. As usual and as a big thanks for the support we get from all of the customers of our web shop and followers of our website in general we are sharing the GPS locations of all the epic camp spots we find. After a slightly rocky start back in part one we finally reached Romania and Transylvania. It was an interesting place that felt like we had stepped back in time. Part three will see us traveling through Croatia, Slovenia, into Italy and through France before landing back in the UK. 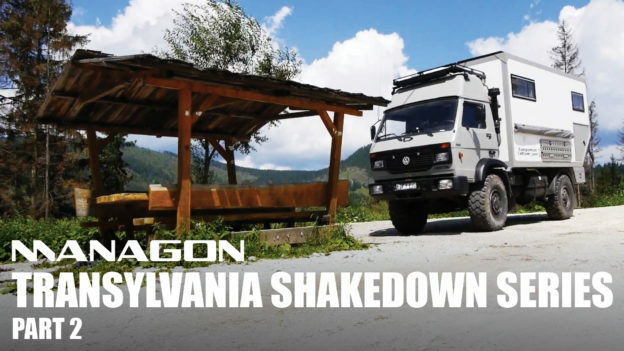 This entry was posted in The Managon Project VW/MAN 8.150 Overland Truck Build, Transylvania Shakedown Film Series on November 14, 2018 by jed@CampervanCulture. This is part two of a three part film series that you guys are invited to watch and be in the driving seat with us and along for the ride. As usual and as a big thanks for the support we get from all of the customers of our web shop and followers of our website in general we are sharing the GPS locations of all the epic camp spots we find. After a slightly rocky start back in part one we finally reached Romania and Transylvania. It was an interesting place that felt like we had stepped back in time. 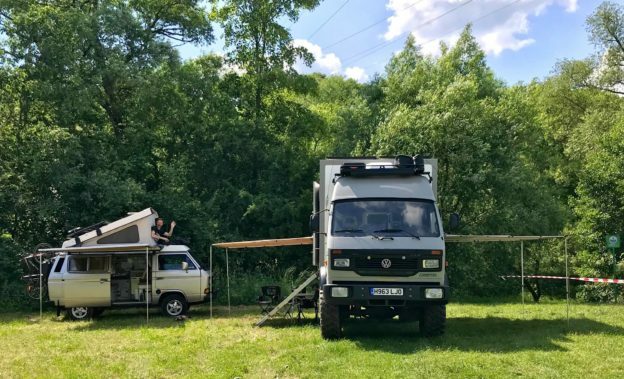 This entry was posted in The Managon Project VW/MAN 8.150 Overland Truck Build, Transylvania Shakedown Film Series on November 7, 2018 by jed@CampervanCulture. This is part one of a three part film series that you guys are invited to watch and be in the driving seat with us and along for the ride. As usual and as a big thanks for the support we get from all of the customers of our web shop and followers of our website in general we are sharing the GPS locations of all the epic camp spots we find. After a slightly rocky start this time we finally go underway and trucked on through France, Belgium, Luxembourg, Germany, Austria and Hungry. Part two will see us traveling through Romania and the Transylvania region and part three will see us in Serbia, Croatia, Slovenia, into Italy and through France before landing back in the UK. Please sit back, grab a beer and a couple of snacks and hit the play button to be with us on this epic trip out east. 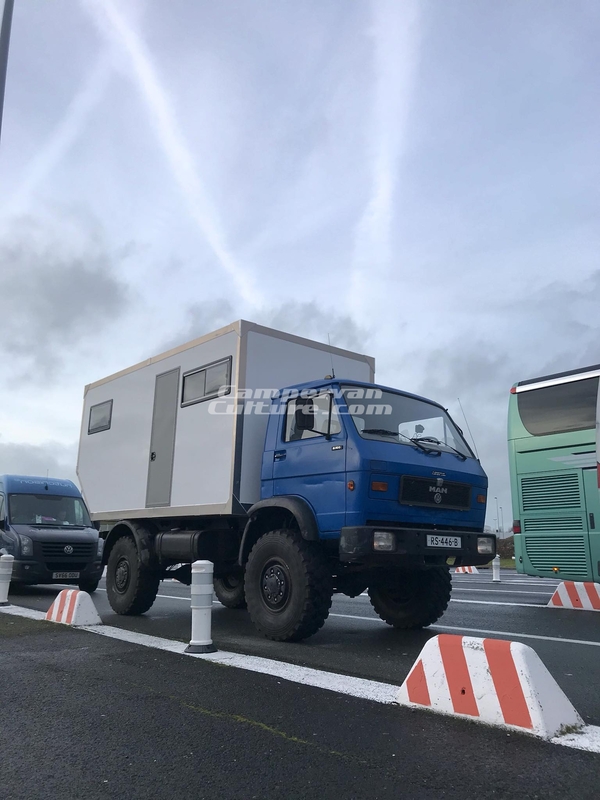 This entry was posted in campervanculture.com, The Managon Project VW/MAN 8.150 Overland Truck Build, Transylvania Shakedown Film Series on October 31, 2018 by jed@CampervanCulture. Sooo.. the last 6 months has been full on, and it was much needed work so we can slip back into making the short films that we are known for bringing to you for your viewing pleasure, in the hope we may inspire some of you. On the flip side of this coin it also gives a lot of you to reach out to us so you can (and almost 100% of the time) inspire us into doing something or going somewhere via social media interaction. 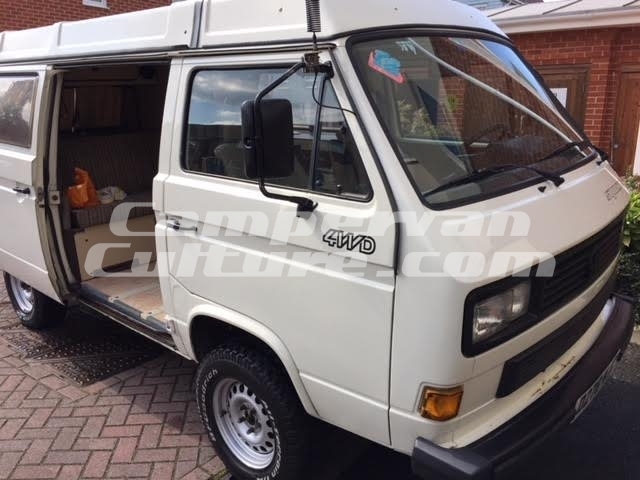 This entry was posted in campervanculture.com, The Managon Project VW/MAN 8.150 Overland Truck Build on June 25, 2018 by jed@CampervanCulture. Campervan Culture are very excited to introduce you to the BigShot shifter from RS Fab. The very first full CNC’d Vanagon shifter. No more plastic to wear and break. Tired of sloppy shifting, now you can get rid of it! Shortened throw by 39%, Crisp and Tight. When you’re looking for a gear, no more flailing, find it every time. Please note 1″ aluminium shaft and knob are only available in black. We are on our second or third stock shipment just now and as they are proving so popular we figured it is about time we made a fitting video for you nice folk. Stock gearsticks have always been prone to snapping at inopertune moments (is there a ever good time) due to their hollow construction. The Big Shot’s heavy duty 1″ aluminium shaft will ensure that there is never a risk of that happening again. Especially suitable for hard driving Syncro owners. Can be used in both LHD and RHD vans, you just orientate the gear stick to your desired position then lock the nut down. 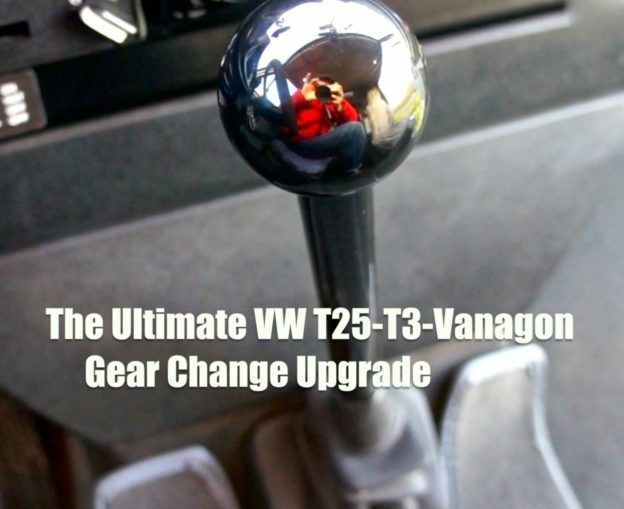 Campervan Culture are the exclusive distributor of the Big Shot shifter and handle all world wide sales outside the USA. 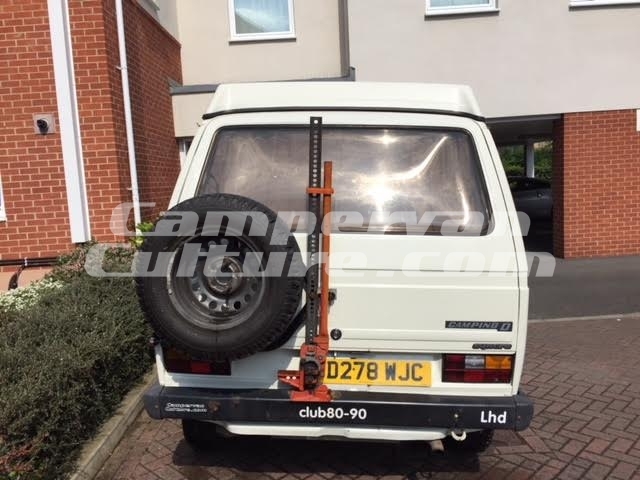 This entry was posted in Mechanical, Product Review on April 8, 2018 by jed@CampervanCulture. Well it was time to finally go fetch the truck. The formalities of doing this are as follows for those interested in how to do it. The Vehicle needs to be registered to the person you are buying it from. The vehicle needs to have a valid Dutch MOT. In our case we managed to get it registered in Holland as a Motor Caravan to save hassles here in the UK later. You need to get export plates from the Vehicle registration office in Holland before you can drive it out of Holland (this takes 10 minutes and is very easy). You need the previous owners documents, your driving licence and your passport. Unlike Germany insurance is not possible to buy with your export plates at the vehicle registration office, no matter what people tell you. You need to arrange your own insurance before you leave in the UK. The Caravan and Motorhome Club will give you insurance using the chassis number. They were the only one apart from one other place (the other places quote was over £2000!) that would issue this pollicey. Other companies will issue on chassis number but the vehicle has to be on UK soil so no good for export. If you have RAC recovery for UK then The Camping & Caravan Club (different company to the Caravan and Motorhome Club) will give you a code if you join (£45 per year) that you can give to the RAC and they will upgrade your UK policy to cover trucks for the UK and for full European cover for an extra £80 per year. The Channel Tunnel crossing can be as little as £55 for a truck each way. This can be done by buying a ‘Frequent Traveller’ package. You buy 10 crossings up front for £44 each way and pay a £11 surcharge on top per crossing when booking your crossing time. I had my time booked for 7.30PM and arrived at 4.30PM. They let me cross for free at 4.50PM and the crossing takes just over half an hour. You just need to book one day in advance. You stay in the vehicle all the time so can have a quick nap or make food in the truck. I thought I was really on the ball this time but after booking everything I realised last minute my passport had expired! This then meant everything was the usual mad rush to try and pull this off. 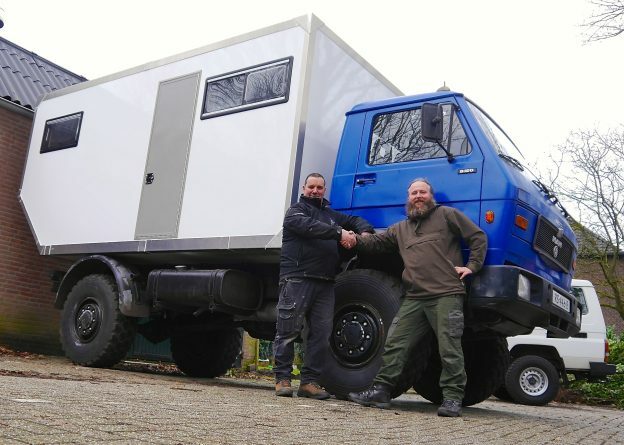 This entry was posted in campervanculture.com, The Managon Project VW/MAN 8.150 Overland Truck Build on January 28, 2018 by jed@CampervanCulture. 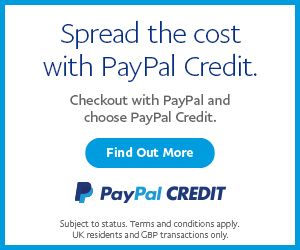 As with all the vehicles we list on CVC, please do not contact the owner unless you have the actual funds to pay for it. No part exchange offers, no “I just need to sell my bay window first to get the money” no turning up without being able to pay the asking price. 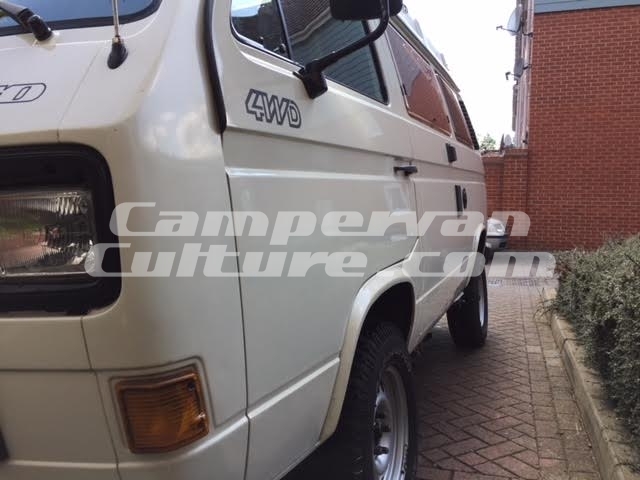 It is with a heavy heart that I have decided to sell my beloved VW T25/T3 Westfalia Joker Syncro. It has given me great pleasure over the past seven years and I will truly miss her. replaced due to an incident with fuel pump protection bollard..oops. She had a full body and roof respray in 2011 and featured in CampervanCultureulture.com “Syncroshopping” video series. The paint job is starting to show it’s age and could do with a freshen up tbh ,it is no way rotten just cosmetic. Virtually all wearable parts were replaced with OEM replacements and poly bushes used in most areas. rear mounted wheel carrier and decoupler, as you should know the Westfalia Syncro comes with both front and rear difflocks. As my child has grown out of wanting to go camping and that was the main reason for purchasing it. I want her to go to a good home and am in no rush to sell,these are a very rare and unique vehicles, she is taxed and tested and in good working order. Some Parts of Bodywork need attention was quoted £1300 to repair. 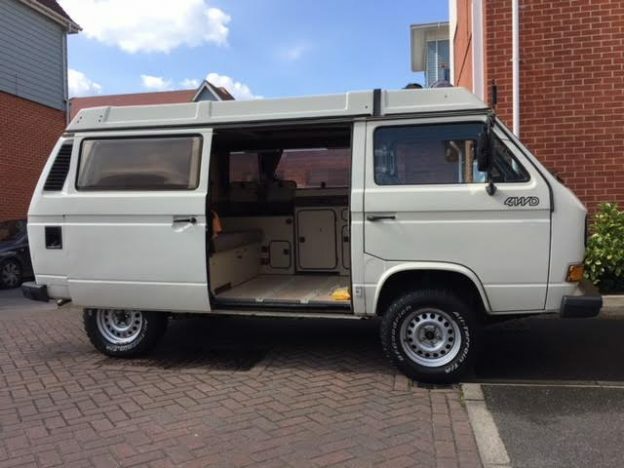 Syncro Shopping from CampervanCulture.com on Vimeo. Syncro Shopping 2 from CampervanCulture.com on Vimeo. Syncro Shopping part 3 from CampervanCulture.com on Vimeo. 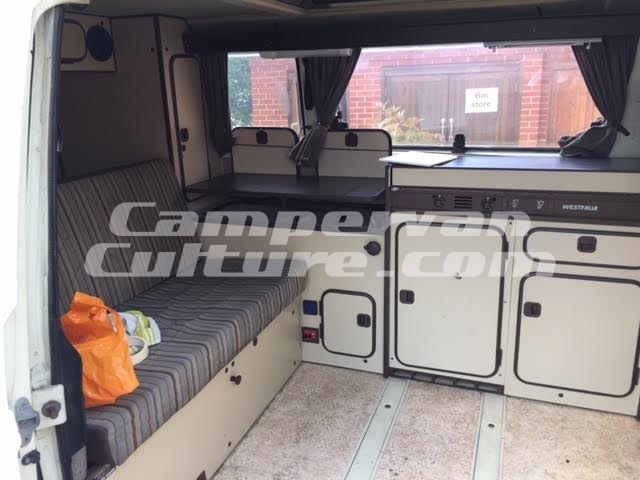 This entry was posted in For Sale on December 24, 2017 by jed@CampervanCulture.